Halmahera is the largest island in the Maluku archipelago. Because of the mountainous landscape it is however the most sparsely populated, considering the size. Population is about 130.000, and there are no large cities here. Only on the northern peninsula there are some infrastructure and villages of any significance, there are some villages on the southern peninsula as well. The population are mainly Muslim with a mix of ethnic backgrounds; Arabs, Indians, Portuguese, Dutch and Malay. The island is full of remains after WW2, but also lovely beaches and a beautiful landscape where you can walk to and visit traditional villages. These days there are no regular flights here, but there is a boat from Manado once a week and also boats from Ternate and Morotai. On the island there are quite good, regular bus routes in areas with roads of adequate standard. Most facilities for travelers can be found in the town of Tobelo on the northern tip, this is also a hub for bus and boat transport. Major products from Halmahera is copra and cacao. Area of Halmahera is 17.780 sq. km, of which most is covered by inaccessible mountains, the highest point is Gunung Gamkonora, an active volcano that reaches an elevation of 1.635 m. The island is composed of four peninsulas, separated by wide bays. The Kao Bay to the north were during World War II a base for large numbers of Japanese forces, more than 300 fighter planes, a lot of bombers and about 60.000 soldiers. Almost the entire force were annihilated during an allied attack under the command of General McArthur. This took place in the last phase of the war in order to take control over the strategic Morotai island north of Halmahera. Surviving Japanese soldiers escaped into the dense forests, and a local story tells about a soldier who came out of the forest in 1975, unaware that the war was over. The locals say there are still surviving Japanese soldiers living in the forest of the island (fascinating, but not very likely). An allied airbase were established on Morotai with long runways for bombers, a base that was of great importance in the continuing efforts to conquer the Philippines and Japan. Many plane and ship wrecks can still be seen here as a memorial of the war. Morotai is the northernmost island in the Maluku, the largest cities are Wayabula, Berebere, Busubusu, Sangowo and Daruba. Daruba at the east coast has an airport with irregular flights and some accommodation. This is also the largest town on the island and a hub for transport, the only large road starts from here and continue to the northeast. The conditions for diving are supposedly good on this island, and it is also a nice place for hiking in the relatively flat landscape. 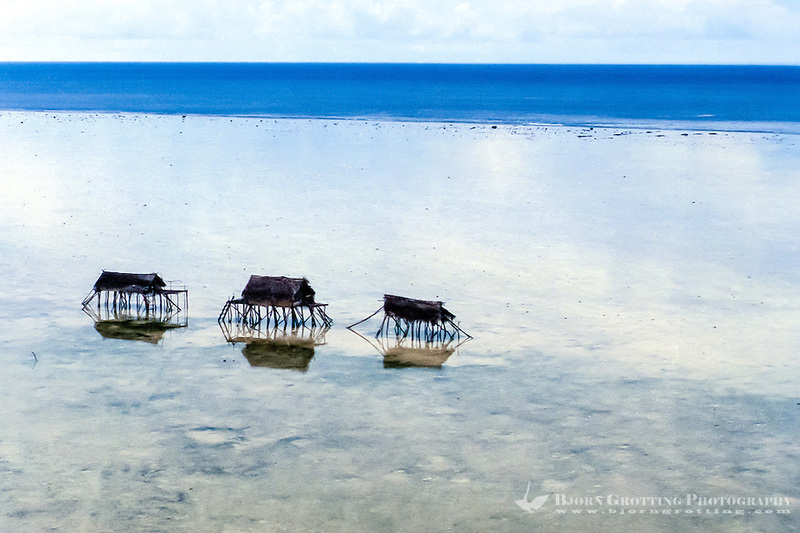 West of Halmahera there are five small islands that were the original Maluku, and for hundreds of years they were an important destination for traders from many nations. This was the famous Spice Islands, and with their exotic spices they represented enormous values. One of them, Ternate, was in former days the undisputed power and trade center of Maluku. Today Ambon has taken over this role, but Ternate is still number two when it comes to importance. The population on this island is about 80.000, most live in the city of Ternate. This was the first island in Maluku to accept Islam, and today a majority of the population here are Muslim. Most important products are (of course) spice, fruit and copra. Ternate is mountainous, the highest top is Gunung Gamalama, an active volcano rising to an elevation of 1.721 m, in fact this mountain is the island. It is possible to climb to the top, preferably with a guide. The view on a clear day is said to be great. 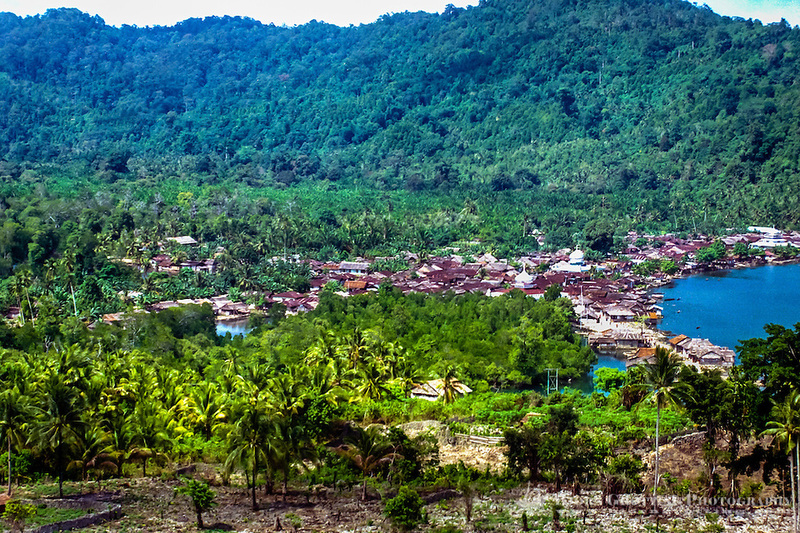 All villages are located at the slopes of Gunung Gamalama. In Ternate town you can see the Sultan’s palace, built around 1250 AD and now turned into a museum. Other attractions are an old Dutch fort, Benteng Oranye, which was built in 1607 on the ruins of a Malay fort, it was the headquarters of the Dutch until 1619 when the power were transferred to Batavia (Jakarta). There are some accommodation in this town. The Danau Laguna lake is covered by Lotus flowers and some holy crocodiles are said to live here. Along the coast line there are some nice beaches and good fishing conditions. Ternate’s neighboring island Tidore was also a powerful Islamic Sultanate that claimed parts of Halmahera and Irian Jaya. The rivalry between Ternate and Tidore led to several wars, peace was established in the area as late as in 1814. For travelers Tidore has less facilities than Ternate, and is maybe best to visit on a day trip from Ternate. From there you will arrive in the village of Rum, where a road continues to Soa Siu on the east coast, the largest city on the island. 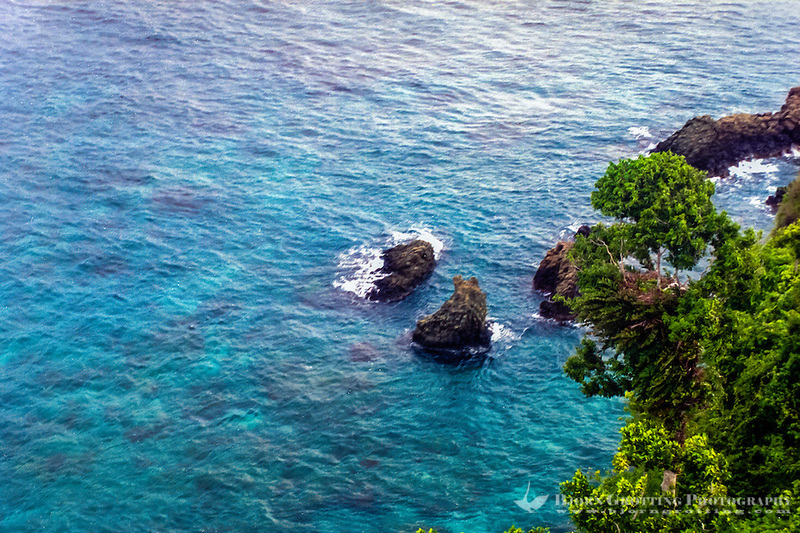 From Rum you can also travel with boat to the small Pulau Maitara island on the west coast, here you will find excellent conditions for swimming and snorkeling. The Gunung Api Keimatubu volcano, 1.730 m, can be climbed with the assistance from a local guide, the climb to the top will normally take about five hours.